If you have been listening to my radio show PAWsitive Radio- All things Pets! you likely know how important the topic of supporting animal shelters and rescue organizations is to me. There are many ways to support your local shelters. And it doesn't always involve writing a check.You can volunteer, donate food or other supplies shelters need. We often donate a portion of our booksale proceeds from On Toby's Terms to different shelters and rescue organizations. 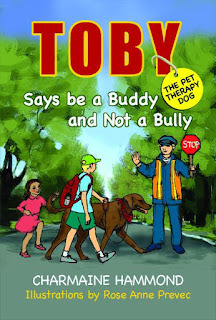 Toby the Dog and star of On Toby's Terms and Toby the Pet Therapy Dog & His Hospital Friends. 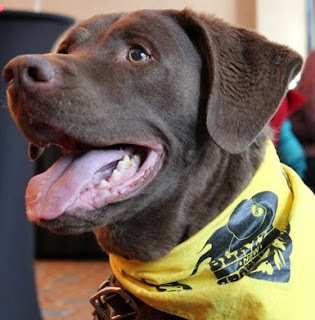 Toby raised more than $10,000 for local animal charities and engaged more than 10,000 people on his kindness mission. Giving back and PAWing it Forward can be fun, creative and makes a big difference! Chris Ruben the Founder and CEO of AdoptAShelter.com shared how Adopt A Shelter works. It is a FREE and Easy way for shelters to do fundraising and it is fast! In fact, EVERY time you shop online using AdoptAShelter.com website, you can earn more money for your favorite animal charity. When you shop through AdoptAShelter.com at one of their online retail merchants (the online mall), Adopt-A-Shelter™ is pays a commission. That means that Adopt-A-Shelter™ directs 100% of the donation displayed on AdoptAShelter.com directly to your shelter / organization or your organization of choice. What a fantastic concept. Shopping made easy, and, it supports animal rescues and shelters at the same time. THE PAWsitive Challenge: On the show Chris and I talked about how important it is to get the message out there, share how Adopt a Shelter works and to make sure your local charities are aware, and are registered (it is FREE). So....... my challenge to all my blog readers. "Toby is a wonderful five year old male Chesapeake Bay retriever. He is very affectionate and loves to be alongside his humans. His hobbies are walking and playing fetch. He is house trained, occasionally vocal when there is something to bark about and an absolutely awesome foot warmer. He is going to make someone an amazing friend." That was the description in the NASAP Pets for Adoption listing. When I read that and saw Toby's smiling face, I knew he'd be the PAWfect family member for us. Toby came to us with his own set of baggage, and even though we became frustrated by his behaviours (breaking toilet tank lids, rearranging furniture, and destroying our closets repeatedly), he brought us so much joy. Toby helped thousands of people, he became a therapy dog and worked in a hospital (through Chimo AAT) and later went on tour - that's right! He was the star of several books, On Toby's Terms (which is being made into a major motion picture) and Toby The Pet Therapy Dog. Toby also inspired me to start my own radio show for pets....PAWsitive Radio- All Things Pets. You can listen to past shows on the archives here (link above) or listen live every Saturday at 3 pm MST. Toby's story is an adoption story with many happy tails.... and one that the legacy just keeps on going. We would LOVE to hear your pet adoption story, please share with us!! Animal Assisted Therapy (AAT) has helped many people .... in hospitals, in schools, group homes, Seniors facilities, to name a few. Our dog Toby was an AAT dog with Chimo http://www.chimoproject.ca/chimo/ and Wednesdays were clearly Toby's favorite day of the week. I was so inspired watching Toby engage with patients, and by the change in environment when Toby was on the hospital unit, that I wrote about it in On Toby's Terms, which was my first book. Toby The Pet Therapy Dog and His Hospital Friends is a book for children to help them understand how good it feels to help other people, how to be a good friend, and the role that animals play in helping people. The other day when talking to a neighbor's child, she said "I really like the part of the book where Toby helps the little boy in the hospital, and I like that Toby is a good friend to Simon." It was wonderful to hear that the message was hear. Have you ever adopted an animal from a shelter? Fallen in love with the smiling furry face on a rescue organization website? I did! 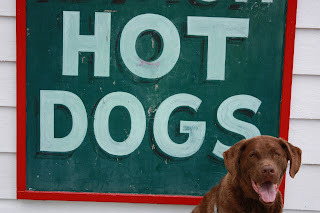 We adopted Toby, a Chesapeake Bay retriever... he had me at WOOF! Big brown eyes, great smile, white teeth, charming personality... a wonderful addition to our family. I am delighted to interview Steven Latham the Producer of the wonderful new PBS show, Shelter Me. Please join us on Saturday August 11 at 3 pm MST on PAWsitive Radio....all things pets. You'll learn more about Shelter Me, these incredible shelter pet success stories and more. Steven is an award-winning filmmaker and the President of Steven Latham Productions. He recently produced and directed SHELTER ME, a family-friendly PBS show that celebrates the human-animal bond with positive, uplifting stories about shelter pets and their new homes. SHELTER ME focuses on the success stories to bring more people into the shelters to give these incredible animals a second chance. Hot Dog! How to keep your pet safe in the hot summer months. Summer’s here. It’s hot outside and if it’s hot for us then it’s definitely hot for our pets. was taken in Burlington, Ontario Canada close to where I grew up. (being turned into motion picture - http://www.ontobysterms.com/). And he was one hot dog!! He attracted attention wherever he went. Sharon McRill of the Betty Brigade was my guest on PAWsitive Radio, she provided some excellent tips to keeping our pets cool and safe. Sharon is founder and president of The Betty Brigade, an expanding personal assistance and concierge company based in Ann Arbor, MI. The Betty Brigade helps busy professionals with moving, home staging, organizing, event planning, pet care, errands – virtually anything clients need done but have no time to do themselves. Now 9 years into the business, The Betty Brigade cares for more than 350 pets in the Ann Arbor, MI area. They mainly have dogs and cats with a sprinkling of birds, fish, bunnies and other furry friends. Sharon reminded listeners to remember to carry water for their dog, and suggested the collapsible water containers like the one shown below (we had one of these for Toby. It was convenient for walks, travelling in the car, and for the days he volunteered at the hospital). Make sure you are not overwalking or overworking the dogs in the summer, it is like us working out in a fur coat. Take breaks, find shade and don't force a dog to keep going if he/she is hot or tired, especially older dogs And, Sharon advises to have a good leash, and always be present and focus on the dog and the surroundings you are walking in. And of course, never get in the middle of a dog fight. On August 11 on PAWsitive Radio, I'll be interviewing Steve Latham, the producer of the wonderful new PBS series, Shelter Me. On August 4 I interview Steve Gamlin. You can listen in, follow the shows or download them later to listen to. Share them and enjoy them.